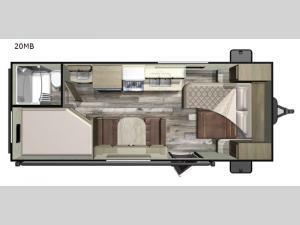 This Starcraft Mossy Oak 20MB travel trailer features a Murphy bed to give you a comfortable place to sleep, as well as transform into a sofa for added seating during the day. Your kiddos are sure to love sleeping in their own set of double bunk beds, and also love the convenience of having the rear bath right next to them! A neat feature about the rear corner bath is that the vanity sink is located just on the other side of the toilet and tub and next to the 6 cu. ft. refrigerator. After the chef of your group has prepared their best meal with the three burner cooktop and the 17" oven, you all can enjoy it at the booth dinette. The booth dinette can also transform into an extra sleeping space too!